There have been many crossover games over the years. We’ve seen the worlds in Disney’s adored classic films as well as the beloved characters from Final Fantasy come together in Kingdom Hearts, and we’ve also seen the likes of Capcom’s properties duke it out against the Marvel universe in Marvel vs. Capcom. 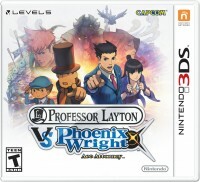 Now two of portable gaming’s most beloved icons clash in Professor Layton vs. Phoenix Wright: Ace Attorney. Professor Layton vs. Phoenix Wright: Ace Attorney, thankfully, is everything players come to expect from botha Layton and Ace Attorney game. 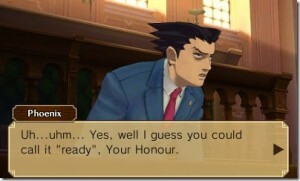 Although the way their paths finally cross is of the utmost random and questionable circumstances, the gameplay itself is a mix of everything that makes both franchises unique and addictive, while combining such nuances as the awesome sound effects you’ll hear in an Ace Attorney game during a Layton conversation and using Layton’s Hint Coins to help identify faulty statements in Ace Attorney. 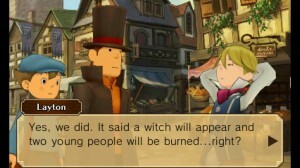 As Professor Layton, players traverse with his apprentice Luke and end up solving puzzle after puzzle, mainly because that’s all anybody in the Layton universe likes to do. Puzzles. Each puzzle is worth a different amount of picarats, which can be exchanged for unlocking bonus content later in the game. Players can also tap specific areas in every back ground to find Hint Coins to assist with the puzzle solving. During trials, you’ll take control of Phoenix Wright as he cross-examines witnesses in order to defend his client. While cross-examining a witness, you can press them for more details, which can sometimes yield new information. The main task is to look for contradictions in witness statements and present evidence that contradicts their statement. As stated, Layton’s hint coins can be used in trials as well. Solving these puzzles and witch trials will earn you Picarats, with more earned for making fewer mistakes, which go toward unlocking bonus content. This includes DLC content which you can download as soon as you beat the main story. There’s even an extra chapter made available. For a spin-off title that doesn’t relate to the main story or series to both franchises, it really does a great job keeping you gripped to the story around it and making you wonder what will happen next. The 3D visuals, which are very well done with a unique art style, are some of the best visuals you’ll see on the 3DS. Players might be able to predict the ending a good few hours before it happens, although it’s no less enthralling when you finally get there. And it actually manages to solve one of the unresolved flaws with the Ace Attorney series by ensuring that Professor Layton’s hint coins also work in court, in case you get completely stuck. Both the soundtrack and voice acting are also superb. You can easily listen to the main theme all day knowing how epic and gripping it can be. Like past Layton games you can go back to puzzles you’ve already beaten or you can solve puzzles you were stuck on a while back. Players don’t have to worry about “points of no return,” preventing you from solving puzzles you might have missed before. Even if you haven’t played any of the games before, this may persuade you to play the earlier games in each series. Fans of both will enjoy the story, making you wish that this could turn into an anime series if it happened. Getting through the main story can take you up to more than 20 hours depending on how much you want to get out of it, but I wouldn’t recommend rushing through the game as it offers a lot to its fans and gamers alike. This is probably the most satisfying video game crossover ever made or seen, and one that plays with the conventions of both franchises while delivering a funny and touching story. The game was purchased by the reviewer, based in the UK, who spent over 20 hours with it, finishing the main campaign before starting the review.